The Great Wall is a Zhang Yimou movie about alien monsters attacking China and Chinese soldiers of the elite Nameless Order (corny name lah) holding them back at the Great Wall. It doesn't have his usual subtle and complex relationships. Oh, and it also has a few random Ang Mohs in it, one of them acted by a fella called Matt Damon who plays a brigand/mercenary. It is an enjoyable but somewhat generic alien battle movie, peppered with occasional propaganda. The visuals and costumes are awesome. My favorite is General Lin Mae (chiobu Jing Tian) and her Flying Crane corps. You can tell they put a lot of effort into the CG and the costume and weapon details. From the movie, I learned that China invented gun powder, hot air balloons and bungie jumping. Matt Damon was ok in the movie. Frankly, his role would have worked with an Asian actor in his place, like Donnie Yen. And Andy Lau's strategist role would have worked better with Tony Leung. The movie also starred the world's most powerful magnet, that can disrupt alien sleep patterns. Still, a fun silly movie to watch and kill time with. Especially when you're in Penang on a Do Nothing But Eat vacation, and Malaysian cinema tickets are cheaper. A (massive) photo essay of my time shooting the Panasonic LUMIX GX85 in Japan. Let me tell you a sad story about my quest to find the right wireless earbuds (don't worry, got happy ending one). It all began when I decided I didn't want wires anymore. I can hear the audiophiles amongst you gasp. Surely he jests, you say. Wired headphones and earphones provide the best sound! I agree. I have many headphones and earphones that I love, that come with wires. But this was 2016, and I felt it was time to cut the cord. At first, I used wireless cans, the kind that went over the ears. It was great, I was no longer getting my wires yanked by people on the crowded train or bus. The sound of those headphones were also decent. But they were bulky and heavy, and when I traveled, I didn't want to pack them along. Then I found some wireless earphones for sale that had decent sound, and I bought them. These were the kind that had a wire connecting the two buds but no wire to your audio jack. You charge them via the tiny micro-USB port on the earphones and the battery life was decent. I got a pair of Jaybirds like that. It sounded good, it was lightweight, it was wireless, and I was happy. Only a week? Yes, because soon after, I LOST that pair of wireless earphones on the bus. How did I lose a $200 pair of wireless earphones, you ask? Simple. When I was talking to someone, I took them off and let them hang around my neck. Then I FORGOT I had them around my neck, and bent down to pick up something or put on my sweater on the bus. And yes, you guessed it, they fell from my neck and I didn't know it. Somewhere out there, there is a happy person wearing my pair of Jaybird X2s. So I bought another pair of wireless earphones, this time, a pair of Under Armor ones. The fit was a bit dodgy but it sounded good, it was lightweight, it was wireless, and I was happy. YES. I LOST MY SECOND PAIR OF WIRELESS EARBUDS. Same way. Except I lost them in the United States of America. Somewhere in New York state. Hung them around my neck. In a park. Forgot about them. Lost them. This wireless earphones thing was getting costly. Then the Erato Apollo 7 came along. I was asked to try them. I was apprehensive. These are expensive earphones. Will I like them? Will I lose them? Where is the wire connecting the two earbuds? They looked like two bullets. I took them out the their aluminium case, that also acts like a charger. I paired them to my iPhone 7 Plus (yes, the one without the headphone jack). And I listened to them. Wow. The sound. Just wow. I took out the silicone tips and swapped them for the supplied Comply tips. These are softer and stickier tips that hug your ear canal tighter. WOW! Better isolation and better bass! There were other accessories in the box, like wings that secure the earbuds better, for running, but I was happy with the fit of the Erato Apollo 7 with just the Comply tips alone. 4 grams only, you hardly feel the weight. I took them on a few trips, like my Taiwan one. I was on a plane, in a hot air balloon, in a bullet train for that trip. I used them every day, for music from Spotify, for phone calls, for watching movies on my iPad Pro. Everything worked nicely with the Eratos. The battery life is 3 hours, and then you pop them into the case and charge them. The case can charge them for another two times, for a total of nine hours of use. At night, in the hotel, I would plug a micro-USB cable into the case and charge the case and the earphones together, ready for another day out. The Bluetooth 4.1 connection means it supports the latest AAC, SBC, and aptX standards. The omnidirectional microphone is very clear during video and voice calls. And did I mention they are WATERPROOF? I also like the little button on each earbud that lets me pause music, skip songs, control the volume, and talk to Siri. If I have one complaint about the Eratos, it would be battery life. Most people won't need more than 3 hours at a time, really. But I was bingeing on the Daredevil and Luke Cage tv series and was watching more many many hours. So my use case is a little extreme. And oh, did I lose them? So far, so good. Because there is no wire between the two earbuds, you don't hang them around your neck and forget they are there. I usually took them out and put them in the case when I wasn't using them. The case fits into my pocket easily, without any bulk. So there is no reason not to carry it on me. Take out the earbud, put it in the case, put case in pocket. Problem solved. I even used them in the National Museum of Taiwan Literature located in Tainan. I downloaded their app and I was listening to the audio descriptions on my iPhone with my Erato Apollo 7 earphones on. You can say I am now a happy camper, with my Erato Apollo 7 earphones in my backpack. They are going to be in the daily work backpack for the commute to work, and also in my travel packing list from now on. I also used them to Facetime video call the wife when I was overseas. The only problem is, she saw me wearing the earphones during the call, and said, "Eh? Those wireless earphones look cool. Do they sound good?" You can check out the Erato Apollo 7 at the Tat Chuan website. Mine are the Gold ones. I think gold is very chio, The Rose Gold ones are also nice. Faith's youngest sister, Joy, is babysitting Puffy the rabbit for a friend. Seems like Faith's autism didn't stop her from enjoying the company of Puffy. Puffy probably thought Faith had food in that packet Faith was playing with. Faith enjoys playing with crinkly things, it seems to calm her sensory issues. I also think the rabbit adores her, for some reason beyond my limited comprehension. It was fascinating to watch my firstborn interact with our new house guest. Kim Huat has a little riding incident. For example, during a moment like this, on a Sunday morning at service, when your autistic firstborn spontaneously rested her head on your shoulder. In October this year, I had the opportunity to test the new 360fly 4k action camera. That is the camera you see above. This little ball takes 360º videos and photos, and is also water-, dust- and shockproof. And most important of all, it has no seams. What does "no seams" mean? 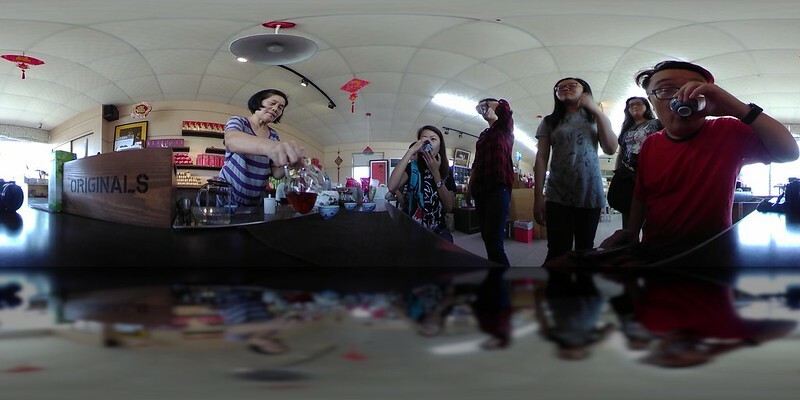 Well, traditional 360º cameras usually have two lenses mounted on each side and the captured images are stitched into one 360º image. The 360fly is just one lens, and captures the 360º view without stitching. This really intrigued me, so I took it to my Taiwan trip to test it out. In Taitung, I went up in a hot air balloon, the only such service in Taiwan. 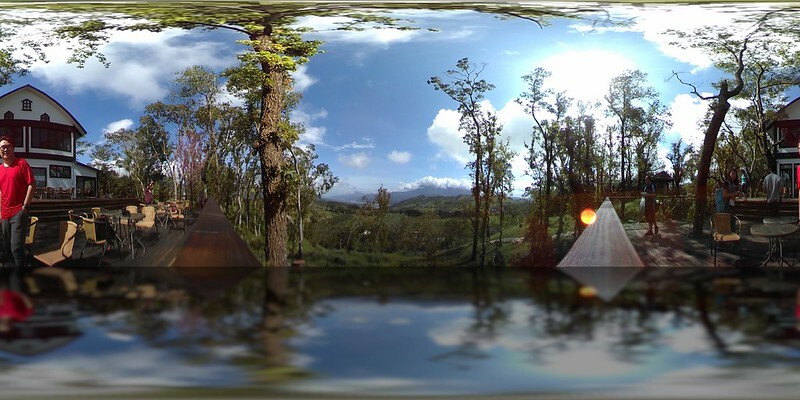 It was a great experience, and I captured it with both 360º photos and videos. It is so cool to be able to capture the whole thing in timelapse, compressing a long process into a few seconds, AND still see it in 360º! 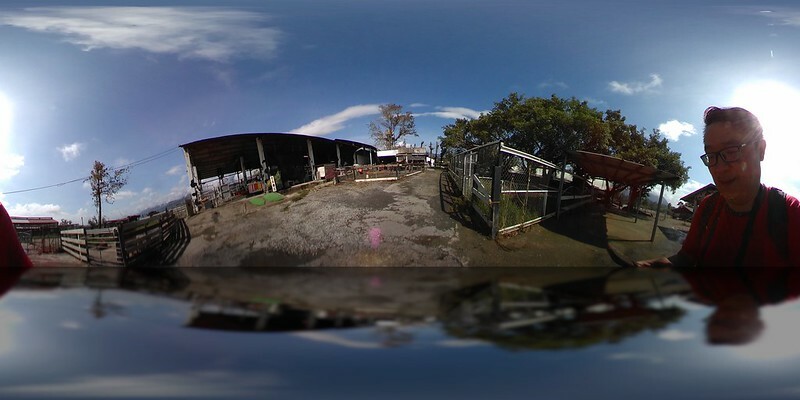 Here is a 360º photo of the ride too. In the Chishang Township of Taitung, we cycled at Mr Brown Avenue (yes, it is really named that) or 伯朗大道. When I took this photo, I was lying on the ground, and didn't realize the lady was cycling straight at me and the 360fly camera. I got away just in time, haha! After Taitung, I visited Kaohsiung and we cycled around the city with the free bicycles provided by the hotel we stayed in. 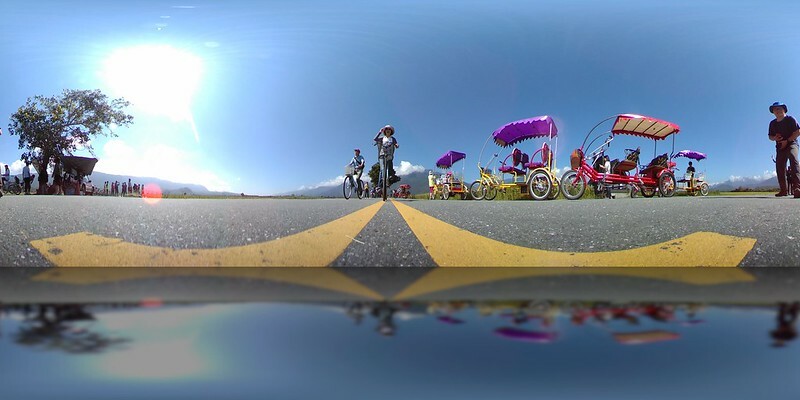 I thought it would be fun to mount the 360fly 4k camera on the bicycle with the special bicycle mount, and give you guys a little 360º video tour of the Huashan Creative Park, home of the Upside Down House and other fun art. We really enjoyed riding around Kaohsiung, though I wish the weather was not so hot in October! 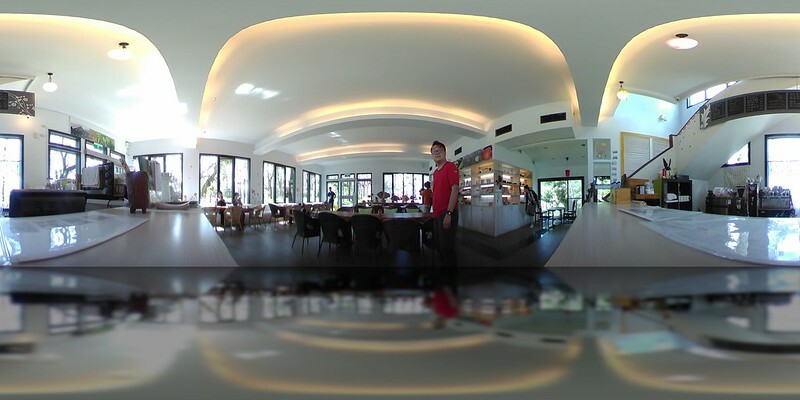 The 360fly camera was easy to use and set up. Once I got the camera paired up with my iPhone via the app, using Bluetooth and wifi, it was easy to control the camera and to see what it saw. 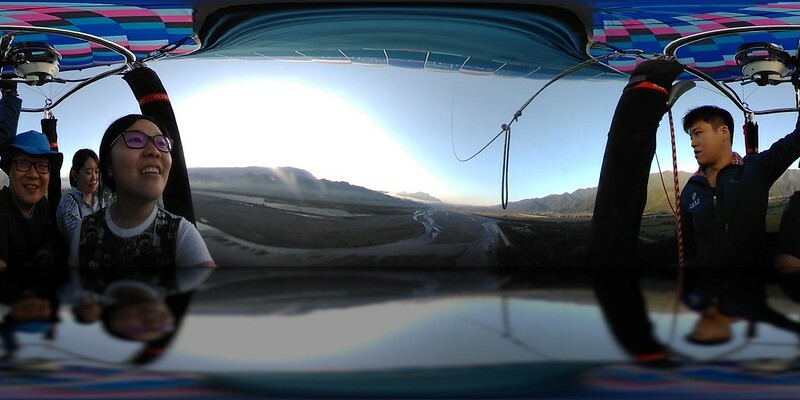 The videos and images are stored on the 360fly's internal 64GB memory, which you can transfer from the camera to your smartphone (via the app) or transfer to your computer (via the PC or Mac application). Charging is done via a magnetic base/dock. You can't stick a micro-usb cable directly into the 360fly to charge it, since the camera is fully waterproof and sealed. So you need to remember to pack the little charging dock when you travel with it. The dock doesn't take up much space anyway. The iOS app I used allowed me to directly upload videos and photos to sites like Facebook, which support 360º videos and photos, so I didn't even need to use a computer for uploads. Very convenient when you want to travel with just the 360fly and your smartphone. I think this 360fly camera will go into my gear bag for my future trips. It is too fun to pass up. Watched Moana with the kids. It was very good. I miss Hawaii already. And now I want to visit all the Pacific islands. The visuals are gorgeous, especially the way they render the ocean. I felt Moana was a good role model for my youngest one. Strong and independent, kind-hearted and determined. Joy told me some of the backstory as to why this movie was made. The Pacific Islanders were the great ocean navigators 3,000 years ago, but suddenly, without explanation, they stopped voyaging for a thousand years, and then restarted it just as suddenly. This story was made to explain this mystery. You can tell that Disney put a lot of research in getting the cultures and histories right. Hopefully, it will get people interested in the stories of the Pacific Islands. Now I can't get the theme song out of my head.